We’d love your help. 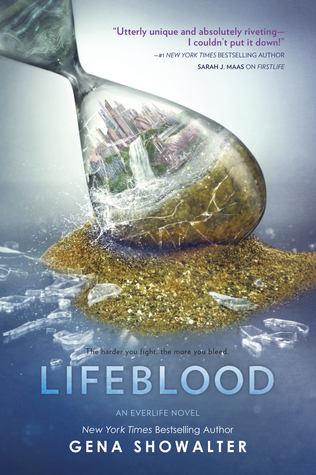 Let us know what’s wrong with this preview of Lifeblood by Gena Showalter. Because Ten possesses a rare supernatural ability to absorb and share light, the Powers That Be have the highest expectations for My Firstlife is over, but my Everlife is only now beginning. To ask other readers questions about Lifeblood, please sign up. When will this book be released? Firstlife was SO good! I so want to know when book 2 will be available!! Harlequin Books Very soon! Release date is Feb. 28th, widely available March 1st 2017. Until then you can enter a very cool sweepstake on Facebook. LIFEBLOOD…moreVery soon! Release date is Feb. 28th, widely available March 1st 2017. Until then you can enter a very cool sweepstake on Facebook. Enter to WIN the ultimate Lifeblood prize pack - including a poster, signed bookplate, gold hourglass and custom 18" laptop sleeve! Will there be more books in the series or will this be the last? Chey Horvath The series is a trilogy. There will be a third book in the series: FirstLife, Lifeblood, & Everlife . Everyone has a story, and I will be the author of mine. Back the bleep up there sweetheart. Have you read your own book? Seriously. I am honestly asking. Have you read your own book? Cause if you had, what the hell happened when these lines were written? I trace a fingertip...He might be firm and muscled everywhere else, but he’s soft as rose petals here, and I shiver. He looks like the bad boy he likes to accuse Killian of being: rough, tough and totally buff. I cannot begin to describe how bad this is. I lean into his grip like a kitten being petted for the first time. I literally have no starting point - it absolutely sucked. It was a dumpster fire. It was a smoldering vomit cesspool. It was...just bad. So incredibly bad. In an effort to give some semblance of structure to my undoubtedly unorganized rant, I will limit myself to what made me want to murder this book most: Tenley, the imconsistencies and the absolute stupidity. She's the kind of girl who in high school would shout out "i'M sO rAnDoM!" after ever sentence. You know exactly who I'm talking about. She's a special snowflake who's absolutely obsessed with numbers - because she's Ten-ley get it? GET IT? THIS IS SO CLEVER THAT I'M LITERALLY DYING RIGHT NOW. We are accountable…count…eight, nine… Ten! Click, click. My name is Tenley Lockwood. “Ten” to my friends. A representative of two equal parts. She also loves talking to herself. Constantly. Five minutes and fourteen seconds ago, I died. Whoa. I’m dead? I must be. My heart no longer beats, and my lungs are deflated. I can’t breathe. I need to breathe. And it honestly feels like she didn't show up for the first book. Killian! His name is a ragged cry from the depths of my soul. I’d say we dated, but dated is too mild a word. Yes, yes it was. Considering you literally never went on a date with him. I am in actual shock. It feels like the author actually forgot what was in the first book. Right off the bat - let's talk about the title. Book 1 completely revolved around lifeblood (which flows through the veins of shells (essentially robots that dead people can possess) ). BUT GENA COMPLETELY IGNORES HER OWN SYSTEM IN BOOK 2. Instead everyone eats manna all the time despite no one mentioning it in the first book. Like lifeblood, it's supposed to heal them and be the only thing their spirits need to survive. BUT if that is really the only thing, then why does Gena just use it as a flavor to regular food - mana bread, mana juice, mana cookies...mana drugs? One of them jabs a needle in my neck, jolting me—energizing me. “A concentrated dose of manna,” she explains. Tenley has super awesome powers which are never explained or evenly explicitly stated. They're just kinda there when convenient. They have this weird thing called Jellyair which gets mysteriously renamed as "the Buckler" until Showalter reverts to the original name. The "Generals" in charge of the war act like eighth grade bullies based on the way they constantly needle and mock their subordinates. And, they are complete idiots. None of the injuries Miss Lockwood sustained were life-threatening. How do I know? She survived. Everyone talks like they are 8 years old and on a sugar high. Wah, wah, wah. Way to ruin a mood. We’ll be on opposite sides of the war, with far different goals. And there's a useless love triangle between the bad boy Killian and good guy Archer. You would think that by killing off Archer, the triangle would die. Wrong. You are the best friend I’ve ever had. I miss looking at you, talking to you, laughing with you. If I could sneak into your room and watch you sleep, I would. She knew Archer for maybe two weeks. Two. Weeks. Whewww ....this rant is already far too ranty for my taste. To summarize: the whole mother-fudging-point of this book is that Tenley is supposedly a reincarnated head-honcho of the war effort and she'll end the war. Yes. Between Troika and Myrad (aka heaven and hell). They are locked in an everlasting struggle because...because...because reasons. Myriadians, you hate us for our Light, and we despise you for your darkness. The two cannot coexist. We know this. We all know this. But why must we war because of it? And that's it. They're at war because they're at war. That is literally the premise for the entire book series. Angela's Booked and I have a reading challenge every year and this year, we had a prompt called "A book your friend doesn't recommend. And she didn't recommend book 1 to me. So, I read book (solely out of spite) so I could not recommend it to her. The ball is in your court Angela - enjoy! I've tried really hard to find flaws in Gena's stories, something I didn't like or didn't understand, I honestly did because I want to be a good critique and not just read and automatically love her books. I've tried and failed. Gena gets me, she's the perfect author for me, everything she writes I love. She is such a tremendous writer and I am so honored to have read an early copy of this book. Lifeblood was an emotional roller coaster, I laughed, rejoiced, stressed, cried, raged, I went through I've tried really hard to find flaws in Gena's stories, something I didn't like or didn't understand, I honestly did because I want to be a good critique and not just read and automatically love her books. I've tried and failed. Gena gets me, she's the perfect author for me, everything she writes I love. She is such a tremendous writer and I am so honored to have read an early copy of this book. Lifeblood was an emotional roller coaster, I laughed, rejoiced, stressed, cried, raged, I went through all the emotions a human being possibly can. I was not prepared, I definitely was not expecting to feel this much while reading it, I was genuinely stressed at times, like knots-in-my-stomach stressed and didn't want to stop reading for a minute. I also cried a lot, some might say I'm a sensitive person, which is true, but it's a well known fact that Gena likes to make her readers suffer, she spared no one and when I say no one I mean no one is safe from her, she keeps surprising me. That said, I absolutely loved this book. Lifeblood was one of my most anticipated book of 2017, I loved Firstlife and wanted to adore this one and, once again, Gena did not disappoint. This series is important to her and it shows, you can actually feel all the hard work she put into it, all the hours spent researching and trying to find the perfect plot. I've never written a book but I'm assuming it's not easy, it can be frustrating, difficult and long but in the end I bet all of that is worth it. Gena, I'm telling you, it was worth it with Lifeblood. I don't want to give anything away but Lifeblood starts right where Firstlife ended so you won't be too lost or confused. You're pulled into the story right from the start, there are no dull moments, everything fits together perfectly, every little detail is important, numbers are too, the poems are still amazing and so clever, you will fall in love with this series even more. The writing is everything, this series is so unique and delivers a beautiful and powerful message. Ten grows a lot in this book, I really like her and I love her evolution in Lifeblood. She learns a lot from her new home and it was interesting to watch her learn how to forgive herself and others, how to become a better person with her hardships and flaws. Of course, her decision to be with Troika will have consequences, especially for her relationship with Killian but you'll have to read the book to find out more. Killian is an important part of the story as well, I don't want to say too much but for all the romantics out there, don't fret, Gena will not let you down. That's all I'll say. I loved loved loved the characters in this book, you'll see old ones and new ones. You'll miss some, love some and hate some. Like I said, emotional roller coaster. Lifeblood was not everything I wanted it to be, or everything I was expecting it to be but it was amazing nonetheless. Gena is not afraid to write things her way, she wants to please her readers for sure but she's the author and she leads the dance, we just have to trust and follow her. I can't wait to read Everlife, I am so ready for the next chapter in Ten's life and I want to know what's going to happen to everyone. Gimme! Can't believe it took me so long to read this because it was fabulous. Full review to come! Having falling in love with the first book in the Everlife series, I knew the second had a lot to live up to and with middle book syndrome being so dominant in this genre, I won't lie, I was a bit nervous going into this. I really shouldn't have been nervous. This book hooked me once again, from the very first chapter. It didn't take me long to once again be pulled back into the unique Can't believe it took me so long to read this because it was fabulous. Full review to come! I really shouldn't have been nervous. This book hooked me once again, from the very first chapter. It didn't take me long to once again be pulled back into the unique world that Showalter created and once again be immersed in it all and fall back in love with the characters. I knew this book would be different, with everything that happened in the first, there was no way it couldn't be but I wasn't expecting to like all the changes. I thought it would be hard with key characters from the first missing but you know what, Showalter pulled it off beautifully without it hurting the story line or drive of the plot at all. In fact, I think it even helped it. So much happens and yet so much stays the same. Ten still has an amazing group of friends to support her and still so much to learn about herself and of course, the war is still raging without an end insight. This was such a fun entertaining sequel and I lapped it up. It was hard to resist and hard to put down. I can't wait to see how explosive the ending will be in the last book. This sequel follows Ten as she has made her decision on where she wants to go after her life is ended. This causes problems for her and the boy she is falling for, Killian. Killian will also have to choose lose the war or the girl? These characters are some of my favrouites ever! They are so memerobale and amazing! The love between Killian and Ten is gorgeous and well written. They are soulmates and I love them with all my heart. Better than book one, still pretty rough. LIFEBLOOD is the second book in the Everlife series by Gena Showalter. I would highly suggest reading this series in order as the first book kind of ends on a bit of a cliffie. Some answers are present in this book but mostly, Showalter raises more questions and puts Ten, our heroine, in some very disastrous situations. One of my favorite parts of the first book was Ten. She’s very independent and fun, but in this book, I think there was a bit of a change in her character. I’m not sure that she’s as fiery as she was in the first book, but that might just be because now she knows she’s in and over her head and must act a bit more rationally. In terms of romance, there’s an interesting one here. I wondered what was going to come from it because really, the first book only introduced them and didn’t explore it as much as I wanted. I still don’t know where Showalter is going with it, but I am intrigued by Ten and Killian’s dynamic. I really like him. There’s a complexity to his character that I find intriguing. We never really know where his thoughts are or what he’s going to do next and I think that keeps the readers on their toes when he’s around. Better than book 1 but not enough to get a higher rating. I am a big fan of Gena's but this series isn't my favorite of hers. Ten and her obsession with numbers still drives me crazy. I think I keep reading this series because of Killian. And now that I'm invested I need to see how it ends, so bring on book 3! There are so many issues with this book I'm not even sure where to start. I guess the first thing I can say is I really don't understand all the four and five star ratings, did we even read the same book? My biggest complaint about this book is the pacing. It's horrendous. Absolutely horrendous. You get no sense of time from the story, you are just slammed with event after event at a break neck pace. The way it reads it's like it happens in just hours, but she explains at one point that Ten has b There are so many issues with this book I'm not even sure where to start. I guess the first thing I can say is I really don't understand all the four and five star ratings, did we even read the same book? I think the worst example of this is when Ten's grandmother dies. Ten is absolutely devastated and thrown into mourning... but as the reader I was sitting there thinking 'give me a break you met her all of five days ago, there is no way you would be that broken over her death.' Because of the pace of the book there was no time to develop any attachment to the characters, yet we are supposed to believe that Ten certainly did. The next killer for this book is the complete lack of consistency. In the first book Mana is described as a food for spirits that only needs to be eaten once a day, yet Ten gets to her ever life and there is constant eating going on. There are Mana restaurants, Mana chips, the apartments have kitchens and she mentions more than once about her cupboards being bare. None of it lining up with the earlier descriptions of Mana. Events after the missions are another example: after her first mission she is told she has to go to a debriefing because there is Always a debriefing, yet she never had to go to another debriefing in the book. After her second mission she is told to go see a healer and told that she is Always supposed to see a healer after every mission, but she didn't see a healer after her first mission... Troika is supposed to be a realm of structure and stability, but there is no consistency there. Then of course there is all the YA tropes to deal with. Ten has just barely entered her second life so let's send her on a dangerous mission and let her lead because she is the protagonist. Oh and let's send her on another mission and another. Let's forget about all the people who actually have experience, the teenager gets center stage. There is still a ton of "Zero!" happening, which morphed into an equally annoying "Lockdown!" And frankly I don't like Killian as a love interest. I hate when romances take the bad boy who has done horrible things, you know like convincing a multitude of women that he loved them when he was really only trying to get them to sign with his realm and once they sign he abadons them and moves on to the next target, and suddenly he just changes everything because the new girl he met is the One. I hate that story line, because men like that don't change, but it gets romanticized in books and movies, and so some women end up living their lives thinking they can change a guy who is a complete jerk, or that if she were just special enough, if she were the One, he would change for her... It's bs and it's been played out so much it would genuinely be refreshing for a good guy to get the girl. I read this one because I was curious about what Ten would do as a conduit, if it weren't for that curiosity I probably wouldn't have picked it up at all. Now that I've read it, I won't be reading another of this series, and I don't recommend you pick up this book unless you are utterly in love with YA tropes, zero character and world develoent, and getting slammed endlessly with events that are trying desperately to drive the plot along. Loved Lifeblood, it followed on very nicely from Firstlife. Ten's Everlife is just beginning in this book, her 'Firstlife' having ended and she now faces loving and protecting Killian as well as being loyal to her chosen people in Trokia. The choices she has to face, the love she finds in friends, the betrayal and the losses are all immense in Gena Showalter's 2nd book. Absolutely loved the first book, the 2nd book, for me, was so different and even better in some ways. The book is well written, easy to follow and has left me with a thirst for book 3, aptly named Everlife! Good golly gosh, there's another one?!?! Lifeblood didn't fully live up to my expectations, as Ten didn't seem the same, strong, independent girl she was in Firstlife. In the first book, Ten, while not being exactly decisive, did manage to be quite independent once she escaped the institution she was locked up in. I had quite high hopes for Lifeblood, seeing Ten deal with her afterlife, living in a realm different from the boy she had spent a lot of time with - one who was protecting her and fighting alongside her until the end. What got to me was that for a lot of the time, Ten was mooning over Killian rather than getting to know Troika and the Troikans she was supposed to spend eternity with. She was not working very hard at unlocking her key to the grid, nor at understanding just how her realm worked. She was quite judgemental, and I found her to be a lot less interesting than she was in Firstlife. There was some action, with fights between the realms, and fights over humans who were unsigned. I just didn't feel like I was involved in any of it in Lifeblood. The realms were less interesting, and I found the characters to be a lot flatter than those I met in the first book. It could be that this one suffers from second book syndrome, and I will definitely pick up the next book in the series, but my expectations will be lowered accordingly before I get to it. Lifeblood was in many ways just more of the same as in Firstblood, though. The realms fighting over humans, and also fighting each other. Light and dark, good and evil *sighs* just that here, Ten was not human anymore, she was a spirit. And she was a lot less discerning of the people around her, not understanding that because they were all spirits, they weren't really different from what they had been as humans. She remembered her life from before, but it didn't seem to me as if she had really learned anything from it. And she didn't appear to realise that all other Troikans also held on to who they had been as humans. Written in first person point of view from Ten's perspective, I think it made it worse because I really didn't enjoy her very much in Lifeblood. It was not fun to be in her head, and even with the dialogues and the action, the story didn't really work well for me. My worth isn't measured by other people's feelings for me. I am who I am, and my worth is my worth. Those dreams... They can mean one of two things: something or nothing. Love that comes with strings isn't love. It's just another form of selfishness, liking what the other person can do for you or make you feel. Is it wrong that I was more excited for the story to be over than the actual story itself? I can't say this enough: this was so much longer than it needed to be. It was packed full of information that had no purpose. It was such an infodump that I feel it took away from the actual story. I'm not sure I want to finish the series. I am good not knowing (or caring) what happens next. Schon den ersten Band der Immerwelt-Trilogie mochte ich unheimlich, der zweite Band reiht sich da, wenn auch etwas schwächer, ein! Ich persönlich bin ja immer ein Mensch, der große Schwierigkeiten mit Reihen hat, wenn er sie nicht hintereinanderweg liest. Ich vergesse einfach viel zu viel, und komme deswegen nie in Fortsetzungen klar; sei es wegen der Handlung oder den Charakteren. So hatte ich auch bei diesem Buch Angst, dass das wieder passieren könnte. Umso erstaunter war ich dann, als dies ü Schon den ersten Band der Immerwelt-Trilogie mochte ich unheimlich, der zweite Band reiht sich da, wenn auch etwas schwächer, ein! Ich persönlich bin ja immer ein Mensch, der große Schwierigkeiten mit Reihen hat, wenn er sie nicht hintereinanderweg liest. Ich vergesse einfach viel zu viel, und komme deswegen nie in Fortsetzungen klar; sei es wegen der Handlung oder den Charakteren. So hatte ich auch bei diesem Buch Angst, dass das wieder passieren könnte. Umso erstaunter war ich dann, als dies überhaupt nicht der Fall war. Gena Showalter führt ihre Leser unglaublich ausführlich in die Handlungen der Fortsetzung ein, während sie subtil die des Vorgängerbandes wiederholt, ohne dass es irgendwie erzwungen oder langatmig wirkt. Auch die vielen, vielen, vielen Fragen aus dem ersten Teil haben sich schnell zu Beginn geklärt, wofür ich sehr dankbar war. Wenn ich etwas nicht mag, dann ist es, wenn Geschichten widersprüchlich oder nicht gut durchdacht sind. Aber ich kann euch versichern, dass das hier definitiv nicht der Fall ist! Allgemein war ich wieder sehr angetan von ihrem Schreibstil - ich hatte schon fast vergessen wie sehr ich diesen mag. Sie erzählt ihre Geschichte absolut humorvoll und in einer Art eines stream of conciousness, also einem ungezügelten Gedankenstrom unserer Protagonistin Tenley. Ich mochte das sehr gern, weil es einfach eine totale unbeschwerte und lockere Art und Weise an sich hatte, durch die man wirklich nur so durch die Seiten geflogen ist. Gleichzeitig ist ihr Stil extrem wortgewandt und ausdrucksstark, womit sie bei mir nur punkten konnte. Somit konnte sie auch das Setting Troikas, in dem die Geschichte nun größtenteils spielt, sehr gut verbildlichen. Anschaulich war auch wieder die Erzählweise der Geschichte, denn der E-Mail-Verkehr aus dem ersten Band setzt sich auch hier wieder fort und bringt immer wieder ein frisches Windchen in die Geschichte, ebenso wie Tenleys Gedichte. Ich fand es bei der Immerwelt-Reihe auch zum ersten Mal sehr auffällig - natürlich im positiven Sinne - wie jede Figur tatsächlich ihre eigene Sprecherstimme hatte. Nie ist das für mich woanders so herausgestochen wie hier, und ich bin davon wirklich begeistert. Auch allgemein haben die Figuren einfach so viel Charakter, dass man sie sehr gut abgrenzen kann. Tenley, die ich ja schon im ersten Band toll fand, habe ich hier wirklich zu lieben gelernt, und vor allem konnte mich die Liebesgeschichte hier absolut überzeugen. Im ersten Band konnte ich die ja nicht wirklich nachvollziehen, aber Killian ist mir einfach so sympathisch geworden. Vor allem hatte ich irgendwie das Gefühl, dass er eine Art Fantasy-Science Fiction-Hardin (aus After Passion) ist, was es mir ja total angetan hat. Durch Tenleys Entscheidung entwickelt sich ihre Beziehung zu einem Romeo-und-Julia-Konflikt, was der Geschichte wiederum einen absoluten Reiz, totale Spannung und definitiv keine Durchschaubarkeit gegeben hat. Obwohl ich keine konkreten Kritikpunkte habe und mir nichts ins Auge gestochen ist, was ich gar nicht leiden konnte, muss ich sagen, dass das Buch auch kein Highlight war. Vor allem mittig kamen für mich stellenweise immer wieder ein paar Längen auf. Gerade die ausführlichen Kampfszenen, die ich im ersten Band noch sehr gern mochte, habe ich hier oft überflogen, weil es für mich nicht relevant war. Ebenso haben mir hier irgendwie die Twists gefehlt. Viele Handlungen konnte ich schon vorausahnen, und hin und wieder hatte ich das Gefühl, dass die Autorin immer und immer wieder Charaktere einführt, nur um sie kurz darauf sterben zu lassen, in der Hoffnung, dass es dem Leser nahegeht. Bei mir hat das leider nicht wirklich geklappt, weil ich mich immer sehr distanziert von den Figuren, abgesehen der Protagonisten, gefühlt habe. Es war dann immer wieder dasselbe. Sehr schade. Gleichzeitig hatte ich hier häufig das Gefühl, dass die Figuren immer wieder 'einfach so' ihre Gegenspieler töten zu können, ohne dass es ihnen wirklich spürbar und tiefsinnig nahe ging. Tode wurden hier einfach so schnell abgehandelt, als wäre es nur ein Videospiel. Davon bin ich leider gar kein Fan. Writing a review for this book is so frustrating. The world building is fantastic. It is such a great concept. Unfortunately, Showalter just doesn’t pull it off. There are so many things I didn’t like in this book. I don’t like the characters, I don’t like the relationships and I hate most of the dialogue (so cringey). Showalter gives this book a large supporting cast but they aren’t fleshed out enough for me to care about any of them. They could all be interchangeable. It seems like the reason Writing a review for this book is so frustrating. The world building is fantastic. It is such a great concept. Unfortunately, Showalter just doesn’t pull it off. There are so many things I didn’t like in this book. I don’t like the characters, I don’t like the relationships and I hate most of the dialogue (so cringey). Showalter gives this book a large supporting cast but they aren’t fleshed out enough for me to care about any of them. They could all be interchangeable. It seems like the reason for the large cast is so that she has plenty of characters to kill off, unfortunately, I don’t care about the deaths because I don’t care about the characters. The book is also woefully predictable. There is one part where there is a spy. It was so so SO obvious who the spy was I was almost thinking it wasn’t them because it was too obvious, but no it was just bad writing. I guess my main issue is there is a lot of showing vs. telling. The main character is constantly going on about how much she loves this guy, how much she wants him but they barely know each other and I just don’t believe it. I will probably read the conclusion to this trilogy because what the hell, I’ve come this far. Seriously it is such a shame because like I said, the world is sooooo good and the concept is great. Lifeblood is the second installment in author Gina Showalter's Everlife series. Lifeblood picks up immediately after the events of Firstlife. As a summary, Showalter's world is a place where Firstlife is merely a dress rehearsal, while real life begins after you die. In the Everlife, the place you go after you die, you are given a choice to sign between two different factions: Troika and Myriad. Troika & Myriad are deadly rivals. There is a third option, one that is for those who remain unsigned when they die. This book was a really good 2nd book in the series. I think the overall concept of the series is creative and engaging, and the plot hasn't disappointed me yet. If you like YA fantasy, then read this series. The story in this book is worth 5 stars. I'm subtracting 4 starts for the horrible writing. I'm giving this 1 star. 5 + 4 + 1 = 10. 10 is the number of times I cursed the author for ruining a fantastic story. I really enjoyed Firstlife, but the author made the characters so unlikable in this book. "I decided to spend quality time with a favorite pastime: counting. On the map, only sixty-six trees are marked - thirty-nine on one side and twenty-seven on the other. Why? Sixty-six is the atomic numb The story in this book is worth 5 stars. I'm subtracting 4 starts for the horrible writing. I'm giving this 1 star. 5 + 4 + 1 = 10. 10 is the number of times I cursed the author for ruining a fantastic story. I really enjoyed Firstlife, but the author made the characters so unlikable in this book. Sixty-six is the atomic number of dysprosium, a lanthanide. A lanthanide is any series of fifteen metallic elements, often collectively know as the rare earth elements. Fifteen is a triangular number: 1 + 2 + 3 + 4 + 5 = 15. Thirty-nine is the atomic number of yttrium. Equal to three trimesters, the length of a human pregnancy. Twenty-seven, the atomic number of cobalt. The number of bones in the human hand. The number of 'cubies' in a Rubik's cube." Seriously? She turned a likable main character into a whiny, hormonal, self-obsessed, Rainman. I couldn't help but hear Dustin Hoffman's voice when I was reading her pointless number-rants. I'm torn between a 3.5 and a 4. Ten ANNOYED MY SOUL at times. Killian is still a super douche to me. It wasn't a bad read. I enjoyed it. I even teared up a little bit at some parts. There is a lot of betrayal and heartache. Some of it is shocking, some not so much. Ten was super whiney at times, and I get it, you died. Life is rough when you are dead. It wasn't as faced paced as I thought it would be. Schon in Band 1 fand ich den Weltenentwurf von Gena Showalter großartig. Es gibt eine dunkle und eine helle Seite und man muss sich im ersten Leben entscheiden, und dann mit der jeweiligen Seite e Nachdem Band 1 zu meinen Jahreshighlights 2018 gehörte, war ich wirklich sehr gespannt auf den Nachfolger, besonders da das Ende doch etwas böse war. Vorneweg, wenn du Band 1 noch nicht gelesen hast, dann ließ nicht den Klappentext dieser Spoiler nämlich. Die nachfolgende Besprechung enthält aber keine. Zero, I really like this series. I'm listening to it and the narrator is doing a fantastic job. I would like to think that once we are done with this life we have another life that follows. Can't wait for the final book.